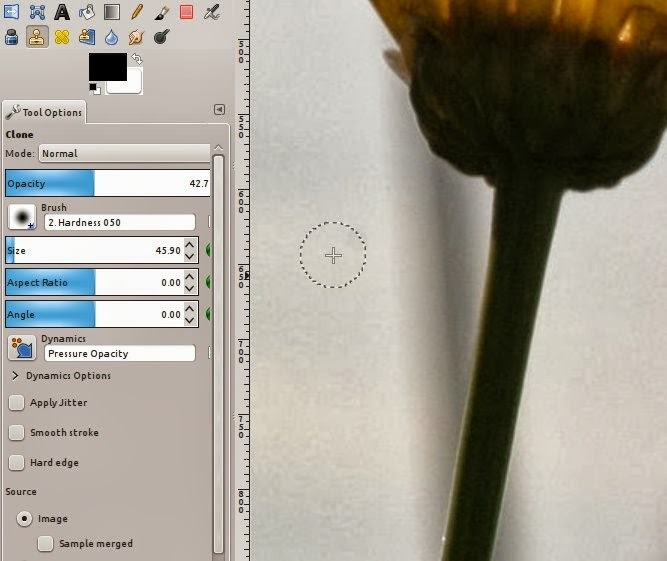 Gimp provides a few tools for removing and adding elements to your image. 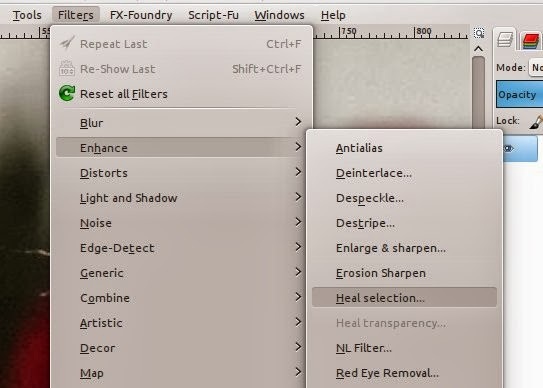 This tutorial will show you examples of when and how to use the Clone, Healing, and Heal Selection tools and list the advantages and disadvantages of each tool. These tools are used primarily to remove elements from a photo (the Clone tool is useful for removing elements AND duplicating elements). Below is a picture of flowers. The photo has a few distracting elements. 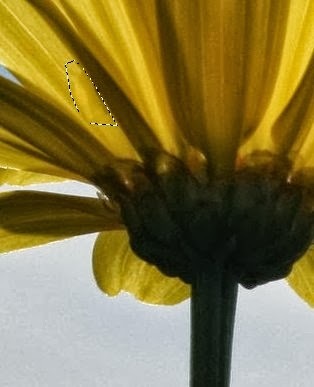 There is a fly on the yellow daisy on the left. Because of dust on my camera's sensor, you can see some dust spots in the sky. 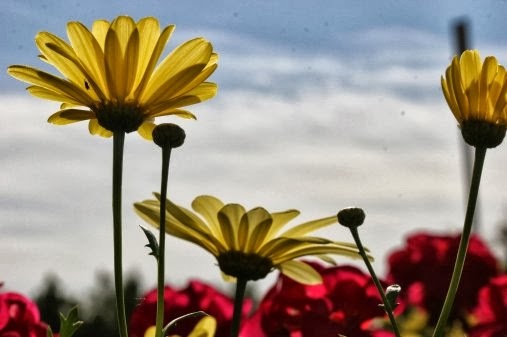 There is a pole in the background behind the daisy on the right. 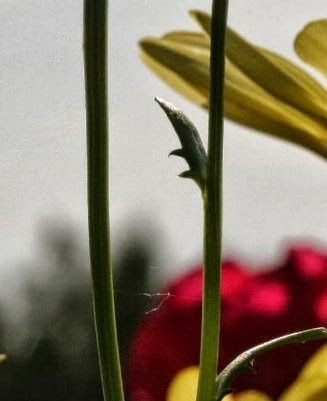 There is a small spider web in between two of the flowers. I will show you which tool is best for removing these elements and show you why. 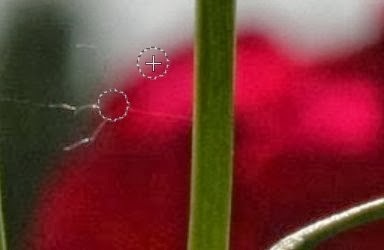 The image below shows a small spider web in between the two flower stems. I will show you my attempt using each tool to remove the web. I first tried the clone tool (Shortcut key = C). I deliberately used a large brush with a high hardness to exaggerate the effect of each tool. Once the clone tool has been selected, I press the ctrl key and press my control point. I selected right above the spider web. Then I clicked on the web and started painting down. You can see that the clone tool does not give us the result we want because it is making an exact clone. For this to work, we would have to make the brush size much smaller and click very near the web. Even after doing this, cloning would take quite a bit of work to get it looking good. Next, I used the Heal tool (Shortcut key = H). I used the same process as I did with the clone tool. Here you can see that we are getting a more desired effect. 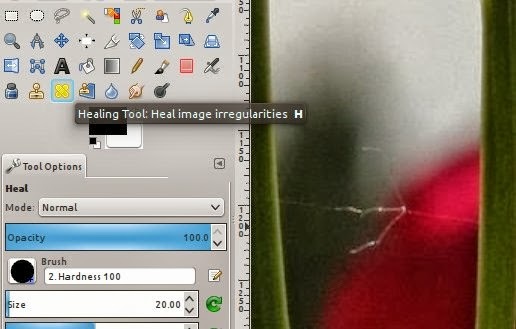 The heal tool is actually blending the colors in the way we want it to. 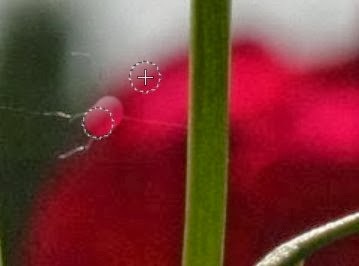 This allows us to remove the spider web, but retain the red color of the background. Lastly, I used the heal selection tool (Filters>Enhance>Heal selection). 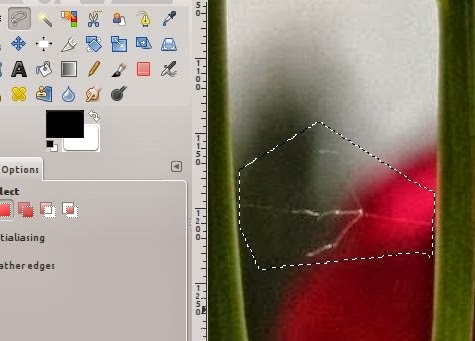 Before I applied the filter, I selected the entire spider web. I used the default tool settings. Below you can see the the result made something even less desirable as what we had before. If I had made a more precise selection around the web, I probably could have used the tool and had it work fine. For removing a small blemishes or elements where it is important to retain the background, the healing tool is best. What it is good for: Removing small blemishes in a photo. What is is not good for: Removing large elements or adding elements. 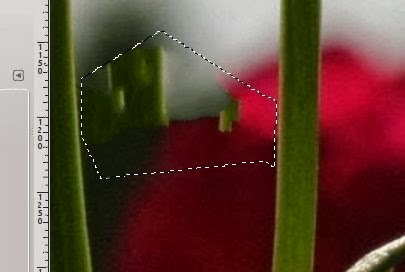 This is the image after having used the healing tool. 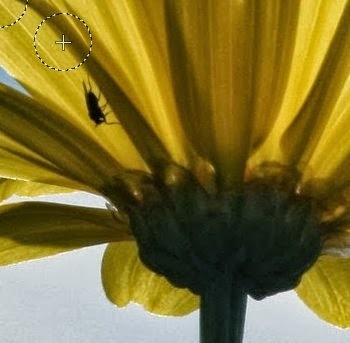 Next we will try removing the fly from the flower. 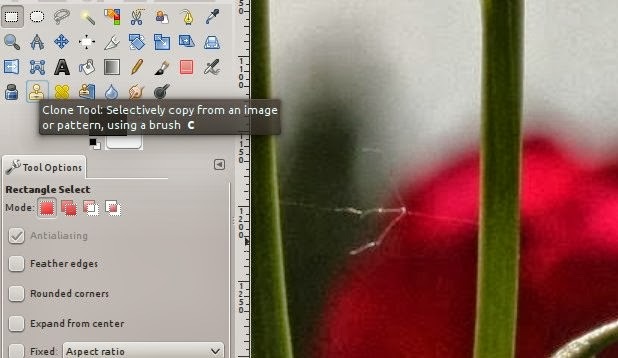 I will use the same steps and tools as before with the spider web..
Below you can see the results using the clone tool. The shadows and colors don't match up. 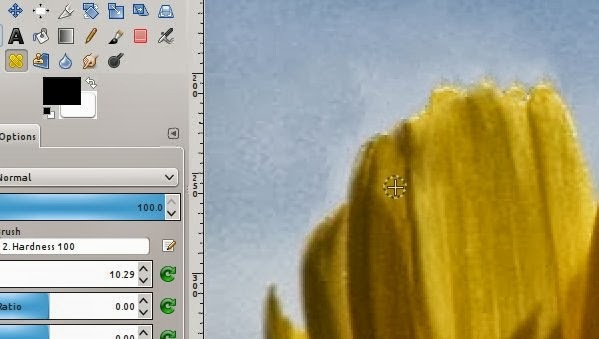 Because of the hardness of the brush, there is a distinct circle shown from the clone. With the heal tool, the colors match up quite well but the shadows still don't match up perfectly, so it makes it look a bit weird (the clone and heal tool work well for elements with horizontal or vertical direction, but not so well with diagonal direction as you can see above). 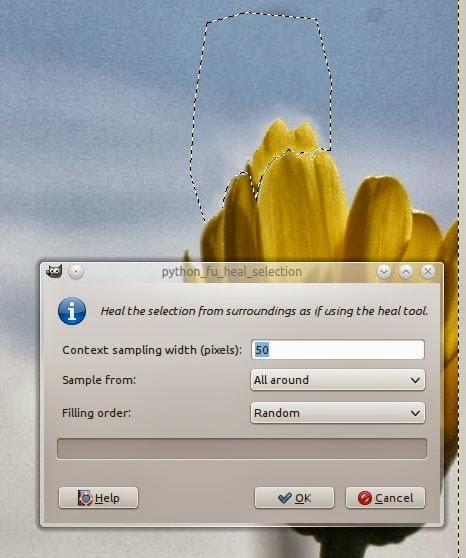 Before I used the heal selection tool, I selected the fly making sure not to select the darker part of the flower petal. I used the default settings and ran the filter. The first time I ran it, it looked quite weird. I simply ran it again and got a different result (the heal selection filter provides different results every time, so it does not hurt to play around with or try a few different times). 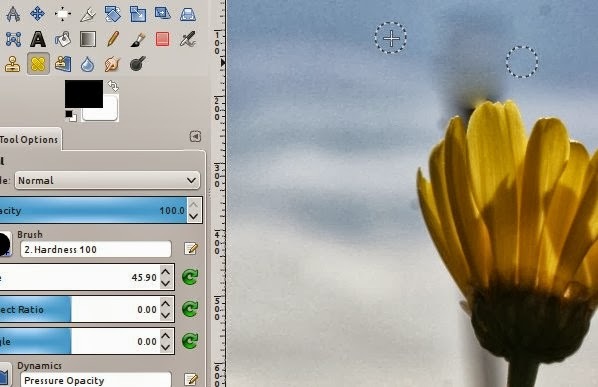 What it is good for: Removing large elements in a photo (it does an especially good job removing large elements with a consistent background. 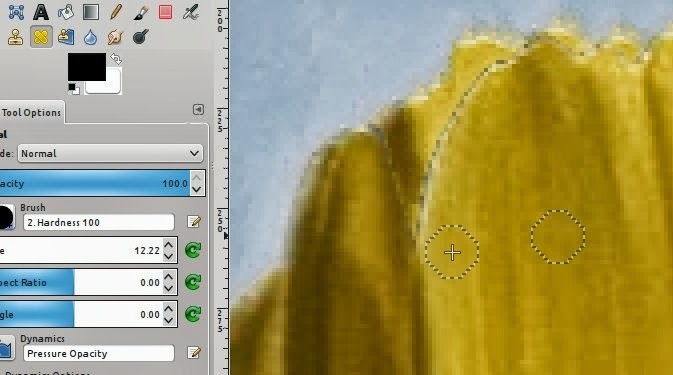 What is is not good for: Even though it can do a great job removing small blemishes, the process of doing this can be a bit time consuming and would be better left for the heal tool. The result here is quite good. The dust specks can be easily removed with just about any of these tools because the background is fairly consistent in color. When I used the clone tool horizontal to the dust speck, it worked quite well. This is because the color is nearly identical. 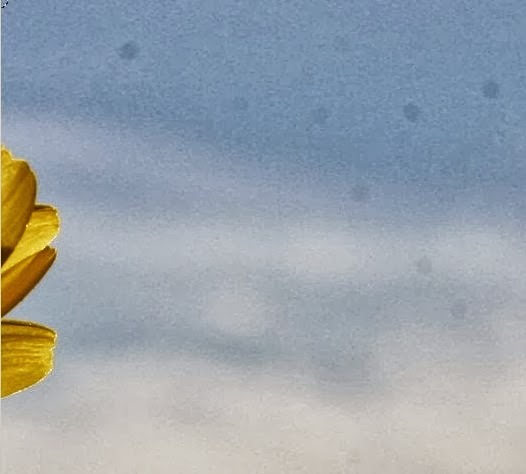 I tried using the same control point for all of the dust specks. 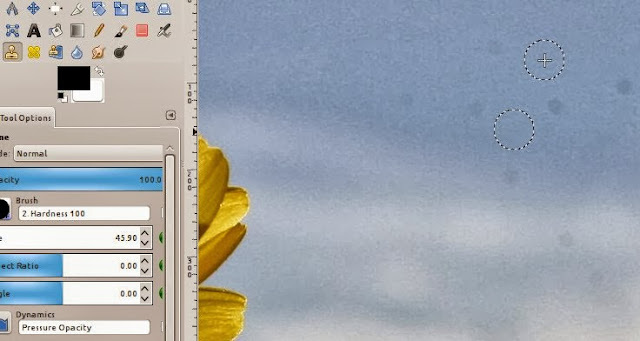 You can see from the image below that the further I got from the control point, the more the clone tool didn't seem to work. This is because the colors are too different. When I did the same thing using the heal tool however, it worked great. 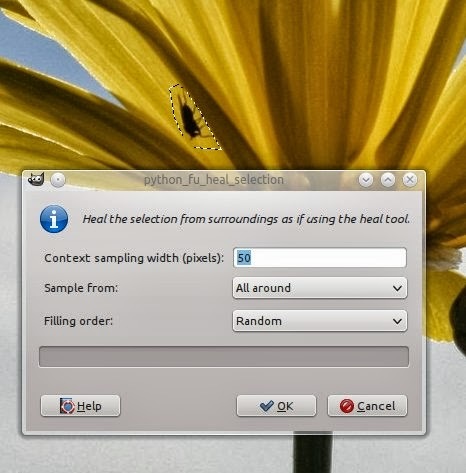 This is because the heal tool combines the colors and does not simply copy them like the clone tool. 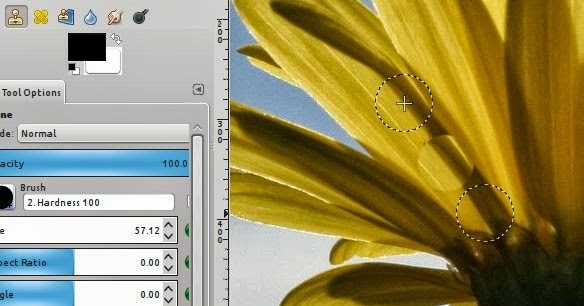 What it is good for: Removing small blemishes with a consistent background. 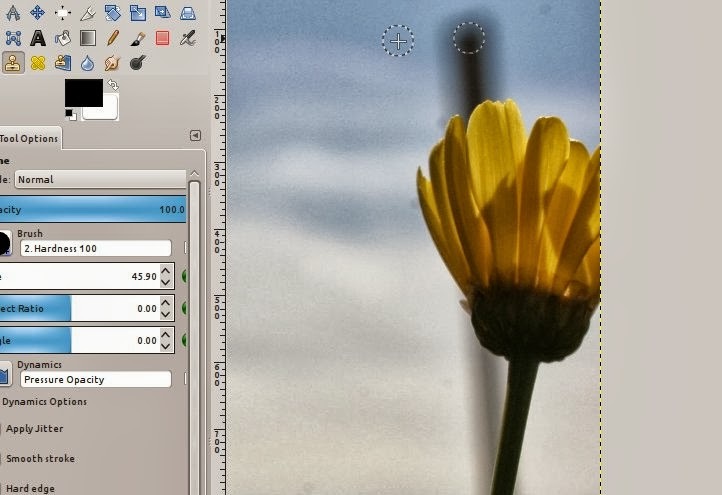 Adding or duplicating (cloning) elements of an image. What is is not good for: Removing large elements. 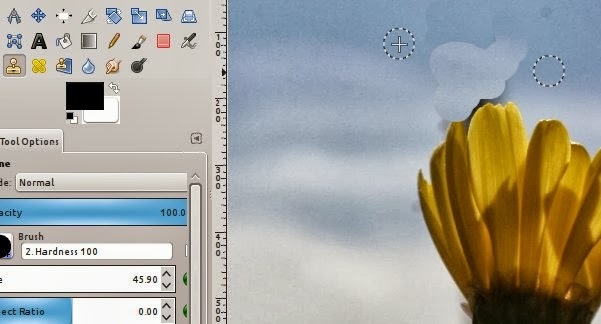 Removing elements with inconsistent background immediately surrounding it. 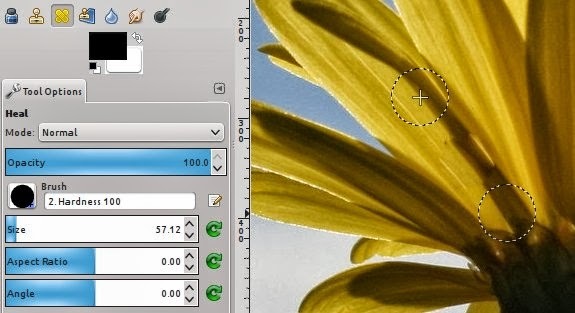 Often it is best to use a combination of these tools to get the result you want. The next thing I will try to remove is the pole behind the flower. When I try to remove the pole using the clone tool, it does quite a poor job. 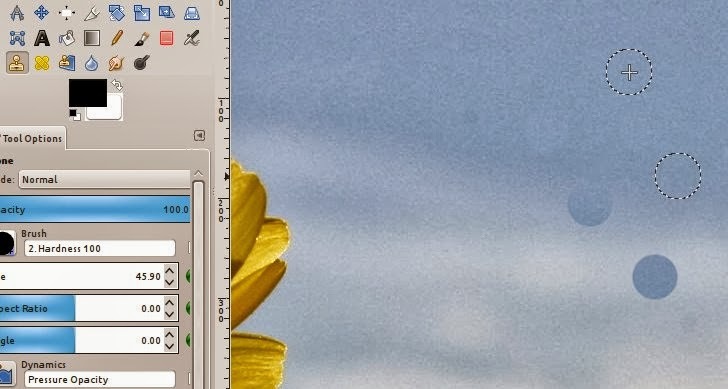 The pole is too large for the heal tool and it makes it look like it is still there, just very blurry. Eventually I used the heal selection filter. This did the best job, though it gave me some added flower. 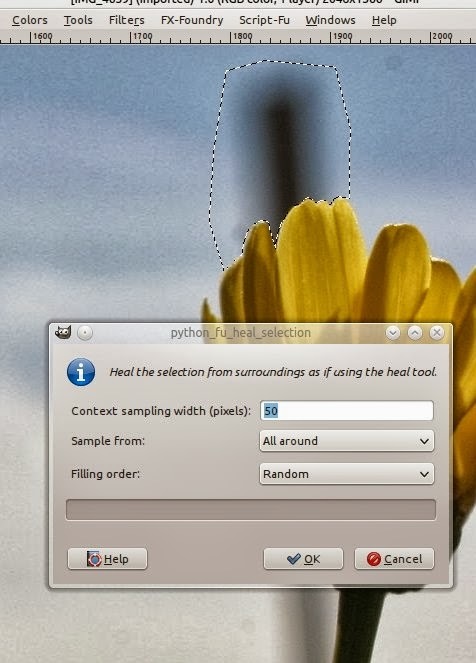 I repeated this the heal selection filter until I got a better result. 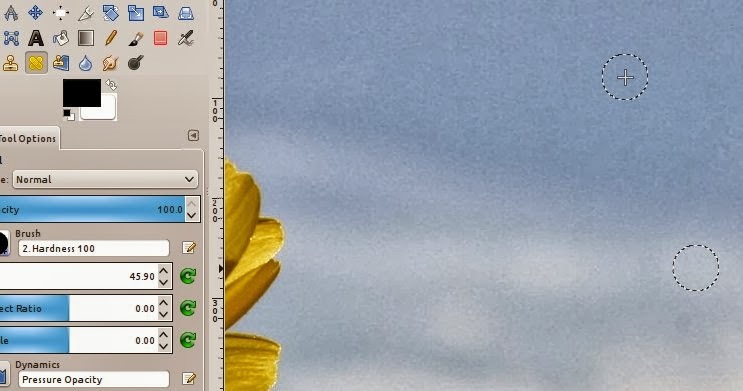 Eventually I just gave up and used the heal tool to make the added flower look like it was always supposed to be there. Here is the final image without the blemishes. Very nice. I was struggling yesterday to understand the difference in the tools - and didn't even know about the one with the selection. Thank you! Clear and easy to understand explanation for each of the tools. Most helpful indeed! Thanks for your comment. I am glad it helped. This helped me get started. Thank you! Very clear and instructive. 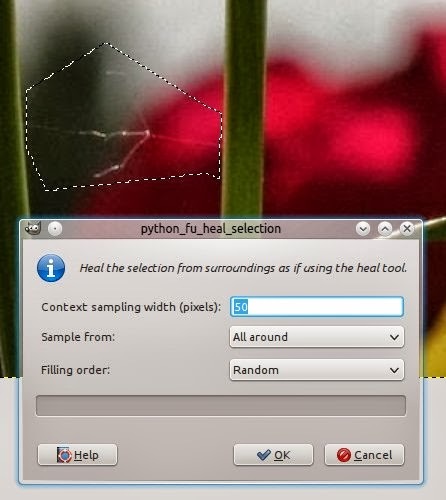 1 question, the heal selection dialogue box shows python_fu in its caption. Presumably this is a custom script you have added, where can I download it? I don't think you have to download it. You should find it in Filters>Enhance>Heal Selection. That being said, it very well could be that this comes with the Linux install (I don't use Gimp in Windows).